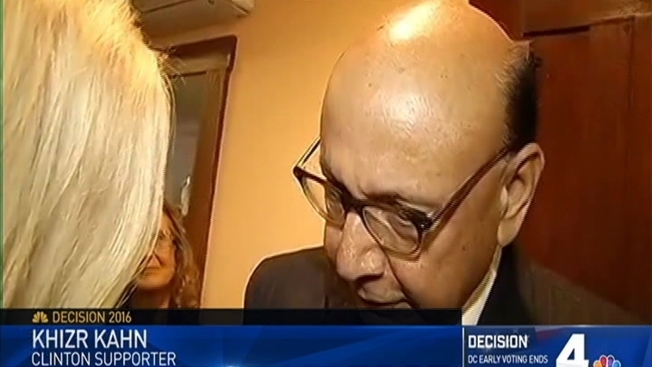 Khizr Khan, the father of fallen U.S. Army Capt. Humayun Khan, campaigned for Hillary Clinton in Virginia on Friday. Khan, a Muslim-American, gained national attention when he spoke alongside his wife during the Democratic National Convention, lashing out at Donald Trump for his proposal to ban Muslims from entering the country. Since the DNC, Khan has become a key ally for the Clinton campaign, appearing in an ad for the nominee and repeatedly speaking out against Trump. On Friday, he met with store owners and fired up supporters for Clinton and LuAnn Bennett, Democratic challenger in Virginia's 10th congressional district, at a diner in downtown Leesburg. "My family is a testament to the goodness of this country," Khan told supporters. A poll released Thursday by the Hampton University Center for Public Policy said Trump is leading Clinton 44 to 41 in Virginia. The poll's margin of error is 4.57 percent. Democratic Party leaders and Khan acknowledged the polls have tightened in Virginia, but Khan said he is not concerned. "I have [a] firm belief that on the day of the election, Virginians will vote for the good values of this country. They will reject - they will reject the candidate that has caused the division that espouses hatred, un-American hatred," Kahn said. Democratic Attorney General Mark Herring said he'll be spending the closing days of the campaign in Loudoun County. "I grew up here, and I'm going to be working as hard as I can through Eleciton Day to make sure that we get our votes out for Hillary Clinton and Virginia's own Tim Kaine," Herring said. Republican leaders in the county said the Hampton University poll came as no surprise. "We knew it was going to tighten, because it always does, and we knew our state was much more conservative than a 12- to 16-point blowout like the polls were saying," said John Whitbeck, chairman of the Republican Party of Virginia. Whether Virginia has regained its battleground status might not be clear until Election Day, but GOP grassroots volunteers say they feel momentum moving their way. "Whether or not any other big-wigs come through, we're out with our message in the last four days. It's 120 hours until Election Day," said Loudoun County GOP Chairman Will Estrada.